Dr Meidong Zhu obtained her MBBS, and MMed of Ophthalmology from Nanjing Medical University in 1982 and 1988, respectively. She was later awarded PhD in Ophthalmology in 1998 by University of Sydney, Australia. Currently Dr Zhu works as a Senior Hospital Scientist in Lions New South Wales Eye Bank, New South Wales Tissue Bank and Australian Ocular Biobank in Sydney, Australia. As an Honorary Senior Lecturer in University of Sydney, she supervises students in Master of Medicine, Master of Philosophy and Doctor of Philosophy studies in School of Medicine of the University. Other positions Dr Zhu holds include Honorary Professor of the First Clinical Medical College, Nanjing Medical University, Medical Advisor in Jiangsu Province Eye Bank，Specialty Consultant in Aier Eye Hospital Group Co. Ltd and Board Member of the Overseas Chinese Association for Visual and Eye Research， Senior Medical Adviser in Greenlight Clinical Ptd Ltd, Australia. 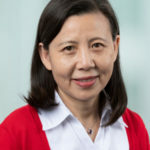 Dr Meidong Zhu has been engaged in clinical ophthalmology, ocular scientific research and teaching, in Australia, China and other countries since her graduation. Her special interests are in retinal and fundus disease, corneal transplantation and eye banking. She also has expertise in various types of ophthalmic clinical trials, in both academic and commercial environments. She has led or participated in more than 50 clinical trials and completed more than 40 research projects at all levels. She published more than 60 articles in the SIC journals. Dr Zhu also participated writing and editing books including “Macular Degeneration”, “Practical Technology in Modern Eye Bank”, “Eye and Vision Research Developments: Eye Disease Associated with Sleep Disorders” and other monographs. Since 1995 Dr Meidong Zhu has been committing to and leading to the construction of Chinese modern eye banks. She has been introducing new technology to the Chinese Eye Banks in many cities, and at the same time, conducting staff training in Chinese Eye Banks. She also set up the relationship with China to help Chinese ophthalmologists participating in training at the Department of Ophthalmology, University of Sydney and Sydney Eye Hospital. In addition, Dr Meidong Zhu is committed to conduct global standardized drug clinical trials and GCP training in clinical trials in China.